Portmanteau Suitcase: Open up that Golden Gate! SMS and I drove to Milbrae and parked the car- free on weekends! Then we took the BART into San Francisco. On the way, I looked up ferry times to Angel Island and realized that if we wanted to have a nice day of hiking and exploring the "Ellis Island of the West" museum, we would have to go another day. It's a State Park and closes on the early side. No matter. I asked SMS if he would mind a change of plans and he didn't. First, we got off at the Embarcadero and went to the Ferry Building. It was bustling as the Farmer's Market was in full swing. What awesome timing! We walked past the produce vendors fairly quickly since we didn't want to carry groceries all day. We went inside and wandered the main hall where the permanent storefronts are. I am a sucker for the Ferry Building. A lot of popular, local businesses have shop branches here and it is just food heaven central! Shops include Humphrey Slocombe, Hog Bay Oyster, Dandelion Chocolate and Cowgirl Creamery. We were pretty hungry and needed a food solution quickly. We decided to have almost a tapas hopping experience, getting small plates from a few different vendors. The first thing to catch our eye was a woman selling Cambodian spiced peanuts. We really enjoyed these as a snack when we were on our Thailand and Cambodia trip so we bought a small bag to share. There was a really nice heat to the peanuts- slightly more mild than in Cambodia but that's ok! SMS commented that he thinks the best mix would be the heat level from here mixed with some of the dried lemongrass spice more typical of the Thai peanut mix. That sounds awesome to me! Next, we passed Cowgirl Creamery and saw their weekend raclette station. Yum! SMS went over and, just to make sure, asked if it was raclette. The vivacious woman manning the station said, "Honey, you know it's Raclette!" While we were waiting, our no-verbal-filter cheeselady talked to her co-worker about a variety of topics to include the various men who hit on her. To her customers trying to pay her, she stopped them quickly with the fact that she doesn't handle money because she's serving food and "money's filthy, I think we can all agree on that!" This doesn't translate well but seriously, it was breathtaking how much she talked and really didn't care who heard her. But, this is not a criticism of her awesome raclette skills since she was great at getting the perfect amount of boiling cheese without burning. We thoroughly enjoyed our plate of raclette cheese, fresh bread from Acme, pickles and pickled onions. After the raclette plate, we each had a steamed bun. I had the vegetarian greens one while SMS had the savory pork. Finally, we finished up lunch with an Italian sugar donut with nutella. It was a delicious meal and we were pretty happy and sated. We walked to the end of the ferry building pier where we saw a fisherman reel in a small shark, which he released back into the Bay. Full House- where's DJ Tanner? Our next stop was the bike rental place because our change in plans involved biking across the Golden Gate Bridge. I have always wanted to do this! I think we could have figured it out on our own but it was nice to rent through a company and watch their guide video and follow their map. If I do it again with visitors, though, I think I would rent bikes in better condition from a bike shop and use Google maps/online resources to navigate. SMS looks like he feels he may have been tricked..."This is not the Golden Gate..."
Anyway, we got our bikes, signed our lives and credit card information away and pedalled off. As SMS was to discover, this was not merely a bike across the bridge day- we were going to see San Francisco! 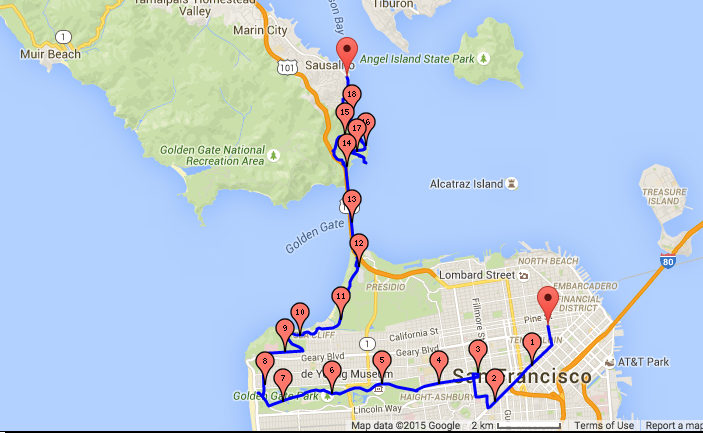 We rode down Market St, took a right and cycled up to Alamo Park. There we saw the "Painted Ladies" houses although as SMS said, "Just call them the Full House houses and everyone will know." There were tons of people relaxing and picnicking but not for us, we were off! We rode through Panhandle Park and into Golden Gate Park. Bikes were the perfect way to see it! We rode past the Conservatory of Flowers. Then we saw roller skating flat track where a guy was skating wearing a "Circumcision is Genital Mutilation" shirt. We saw a flyer calling out for other "Intactivists" which became my word of the day because it's a portmanteau of course! We moved on and biked past the de Young Museum and the California Museum of Science. The Japanese Tea Garden had a long line to get in and we only saw the entrance gate. We cycled through the park, passing the bison paddock and Spreckels Lake. Near the coast, we saw the Dutch windmill and then it was on to the Great Highway, pedalling along the coast of Ocean Beach. Grafitti that says "SMORES NASTY" I am offended. When I have millions of dollars, maybe I'll buy a house here. We climbed the tough hill to the Cliff House and kept going. By the way, did I mention our map said our chosen route was the most beautiful AND most hilly? We cycled along Seal Rock Dr, Legion of Honor and Land's End. We entered into the Sea Cliff neighborhood which was incredibly ritzy- mansions within San Francisco proper! Then it was on to more hills and finally, the Golden Gate Bridge! It was AWESOME! It was crowded but not miserably so. We took a lot of pictures and admired the structure. In fact, before we even got on, we stopped at an informational sign about the dampeners used to protect the bridge from earthquakes (SMS' call!). On the other side, we descended (yes!) a blissfully long hill and cycled through Ft. Baker. Then we went into Sausilito. We locked up our bikes and had dinner at Copita, a pretty tasty Mexican food restaurant. It was definitely time for food! Then we got into line at 730 for the 8 pm ferry. There were a lot of people and we were slightly sweating it as to whether we would get on or not. We definitely didn't want to bike all the way back! We made it and spent most of the trip on the fantail, which had great sunset views. We landed in Fisherman's Wharf and cycled back to the shop via Embarcadero and Market St. It was a little longer distance-wise but pretty much flat which was the most important. I was a little done with hills! Overall, we had a great day! At the very end of the day, I wasn't super-impressed with the bike shop since they were trying to charge a couple for a broken derailer. It doesn't seem fair to charge the customer since the bikes are clearly high-mileage and in very used condition. Our bikes were fine for what we wanted to do (kill ourselves cycling hills), but even ours had gear shifting issues and made ominous sounds. So, word of warning, if you want a nice bike and avoid shady business practices, the tourist trap places are not the best even if their maps are nice!